Rosé may be the queen of summer these days, but sometimes we need something a bit more thirst-quenching to beat the heat. There was a time when I stuck with beer during the dog days. A cold beer on a hot day is one of life’s small pleasures, but the right white wine has a charm all its own on a blistering afternoon. For ages, Sauvignon Blanc was my white of choice, be it a fruity New Zealand quaffer or a lean Sancerre. I was a wine novice and hadn’t yet tried much else. I was missing out. Don’t get me wrong. I still love Sauvignon Blanc, but when it comes to wine, I’m a firm believer in polyamory. No matter where you are on your wine journey, it’s easy to get stuck in a monogamous wine relationship. This can be especially true for white wine because you’re most likely to encounter Chardonnay, Sauvignon Blanc and Pinot Grigio, especially on by-the-glass lists. Just because those are the wines you see most often doesn’t mean they’re your only choices though. Not even close. They’re just the most well-known and thus, the most likely to sell. This little feedback loop can keep you from experiencing the full array of white wine pleasure available. That’s why I want to introduce you to a handful of my favorite whites. It may take a little work to track these down because most are not going to turn up at your local Kroger or Trader Joe’s. Yes, friends, you’re going to need to seek out a proper wine shop. Don’t let this intimidate you. If you really want to learn about wine, you absolutely need to move beyond the grocery store aisles. A good wine shop will have wines at every price point and knowledgeable staff to put you at ease. Because I like a specific style of wine for summer sipping — lean, bright, minerally — these wines may not tickle your fancy if your main squeeze is a big, buttery Cali Chard. I suggest giving them a shot though, especially on a scorching hot day. These wines are all incredibly refreshing and delicious. Besides, exploring a racy little Txakolina doesn’t have to diminish your love for Chardonnay in any way. You may even find you appreciate the attributes of your Chardonnay even more after a little experimentation. So let’s get to the wines. First up is Soave (so-WHA-vay), a subregion of the Veneto in Italy. There was once a surfeit of bad Soave on the market, but those days are gone. Soave is fresh and minerally with citrus, stone fruit and even tropical fruit. A handful of grapes can be used, but Soave Classico must be at least 70% Garganega. One to look for is the 2017 Pra Soave Classico “Otto.” This wine smells like summer — peaches and lime and a bit of minerality — all with a lip-smacking touch of acid. Jacquère is one of the grapes used to make Vin de Savoie in the Savoie region of the French Alps. On a hot day, the crispness of this wine will transport you to a snow-covered mountain under a crystal blue sky. The wine is light with citrus and floral notes, minerality and a lively bite of acid. The 2017 Veronique Anne Perret Vin de Savoie Apremont is absolutely delicious with crisp citrus and pear on the nose. Picpoul de Pinet is from the Languedoc region of France. Picpoul is the grape, and the wines are crisp, low in alcohol and slightly effervescent. The wine is bone dry, but the combination of citrus and acid reminds me of a grown-up lemonade. The 2017 Montmassot Picpoul de Pinet has bracing acidity, citrus & mineral. A fabulous match for shellfish, it’s also delicious all on its own. Txakolina (choc-o-leen-a) from the Basque region of Spain. It’s a fizzy, easy drinking wine served in pintxo bars throughout the region. The 2017 Zudugarai “Amats” Getariako Txakolina is probably my favorite of the bunch. It has the perfect amount of mouth-watering acidity and lime zest to quench your thirst. It pairs really well with chips and salsa, charcuterie or other salty snacks. Vinho Verde is more widely available than the other wines on the list. 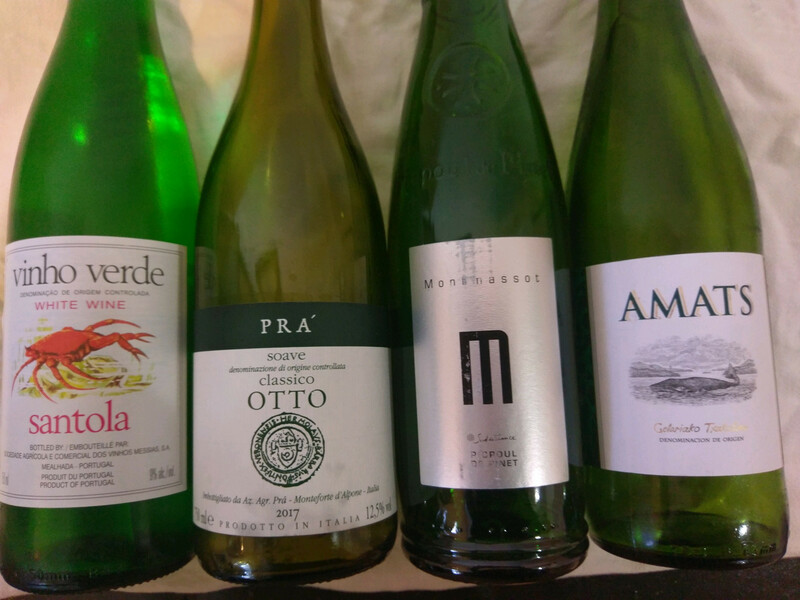 Like Picpoul and Txakolina, Vinho Verde is low in alcohol, high in acidity and a bit fizzy. The Caves Messias Santola “Crab Wine” Vinho Verde is what I reach for when the temperature soars. It’s refreshing, low alcohol and, at $9/bottle, much cheaper than air conditioning. If you’ve been faithful to your old standby, be it Sauvignon Blanc or something else, I hope I’ve convinced you to consider an open relationship. These summer quenchers are all great values at well under $20. At that price, it would be a shame to limit yourself.